Introduction: In this article, Mary Harrell-Sesniak presents 101 of the funniest, quirkiest, or most touching sayings about genealogy that she’s encountered in her career as a family historian. Mary is a genealogist, author and editor with a strong technology background. One thing I’ve noticed is that family historians have great senses of humor—and often come up with funny genealogy sayings. So I searched high and low, and came up with my top list of 101 funny genealogy sayings. Most are similar to others that are displayed without attribution, so I’ve taken a few liberties in compiling what I consider the most humorous versions! 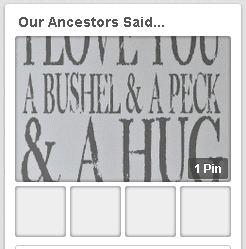 If I’ve omitted any funny genealogy quotes, be sure to add your personal favorites in the comments section so that we can all have a few more chuckles. Some family trees have more sap than others (and mine certainly has more than its fair share). If you don’t tend your roots, the tree may wither away. Genealogy is all about chasing your own tale. “Just the facts, Ma’am.” —(commonly, but incorrectly) attributed to Joe Friday of the TV show Dragnet. A great genealogist is a time unraveler. Genealogy: In the end, it’s all relative. A great party is when everyone joins in the gene pool. An inlaw is someone who has married into your family; an outlaw is an inlaw who resists letting you do their genealogy! Moment of Truth for a genealogist: discovering you are your own cousin. If you don’t know who the family black sheep is, it’s probably you. Do you know where your great grandparents are? So many ancestors; so little time. Genealogists do it in libraries or in trees. Sign for a genealogist’s home office: Family research zone. Disturb at your peril. I am addicted to genealogy. Who’s your great great granddaddy? Remember that when a family member passes away, they take a library of memories with them. It’s a genealogist’s duty to record them before that happens. 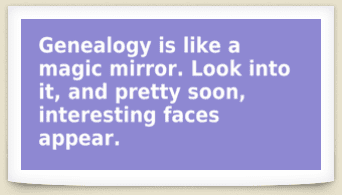 Genealogy is like a magic mirror. Look into it, and pretty soon, interesting faces appear. The kind of ancestors you have is not as important as the kindness of their descendants. If you are the last living link between your grandparents and your grandchildren—don’t break the chain. If you don’t want your descendants to put a twisted spin on your life story, write it yourself! If you’re the family photographer (and not showing up in photos), your family historian descendants will become upset with you. To get your family tree done the fastest, run for political office. Your opponents will have it completed way before the election, and then you can resign if you really didn’t wish to run in the first place. Many genealogists neglect telling their own stories, while in the midst of telling the stories about others. Don’t let that happen to your family. Your children may not thank you, but if you preserve the family genealogy your great great great great descendants will remember you as super-great! If someone’s picture looks like they don’t belong in the family tree, well, maybe they don’t. Some think it’s best to grow a family tree one leaf at a time—but as with the spring, you may find that many buds can be produced at the same time. Don’t take life seriously. Every genealogist knows nobody gets out alive. Genealogists don’t get Alzheimer’s, they just lose their census. Can’t find enough ancestors? No problem. Let me adopt you. I’ve got more than enough to share. Does your family coat of arms have too many or too few sleeves? Taking your children to meet family at a reunion is often an effective form of birth control. 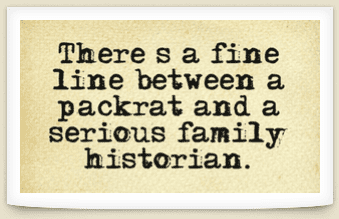 Genealogical paydirt is discovering the ancestor who was the family packrat! Heredity might be better spelled as heir-edity. I can’t find my ancestors, so they must have been in a witness protection program! Motivated genealogists scan once—and then share across the Internet! A genealogist’s bad heir day is when you can’t find what you are looking for. A genealogist’s filing system usually incorporates the floor. Oxymoron: “I love history, but I dislike genealogy.” Don’t you want to tell these people that genealogy is family history? Genealogical enigma: How so many published trees record people who died before they were born. Genealogy theorem: There is a 100% chance that those elusive ancestors weren’t interested in genealogy. Genealogy theorem: The odds that you are related to yourself are probably not less than 100%. A genealogist is a person who leaves no stone unearthed. A cemetery is a marble garden not to be taken for granite. Selecting a tombstone is usually a monumental task. Go ahead and honk your horn in the cemetery. It’s not possible to wake the dead. A cemetery is where “down under” takes on an entirely new meaning. You know you’re a genealogist if the top item on your Christmas list is a genealogy subscription! You know you’re a genealogist if your email contact list contains more distant cousins than immediate family. You know you’re a genealogist if you evaluate the surnames of acquaintances (along with complete strangers) to see how they might be related. You know you’re a genealogist if you know all the maiden names of all your female friends—and if you don’t, you surreptitiously try to discover them. You know you’re a genealogist if you secretly celebrate a forebear’s birthday. You know you’re a genealogist if the highlight of your last trip was a cemetery visit. You know you’re a genealogist if no family member is ever treated as a black sheep (everyone is welcome). You know you’re a genealogist when you realize your collection of DNA results is more important than your nick knacks. You know you’re a genealogist if you immediately understand these abbreviations: BC, DC, MC and VR. Answer the first associated words that come to mind: Ellis, family and vital. If you answered Island, history and record, you know you’ve become a genealogist. You might be a genealogist if you think family history is an ancestral game of hide and seek. You might be a genealogist if dead people are more interesting to you than the living. You might be a genealogist if you love living in the past lane. You might be a genealogist if the phrase “relatively speaking” holds a truly unique meaning. You know you’re a genealogist if a scanner and archival storage containers are more exciting gifts than jewelry (female) or football tickets (male). 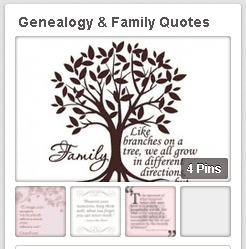 You know you’re a genealogist if you know what inst. and ult. stand for. You know you’re a genealogist if you’ve ever repurposed your dining room table, and panic at anyone going near it. You know you’re a genealogist if your vacation bucket list includes Fort Wayne, Salt Lake City, and Washington, D.C. (hopefully all in the same year). You know your friend is not a genealogist if he/she doesn’t understand why these are top vacation destinations. You know you’re a genealogist if there is a courthouse programmed into your GPS. You know you’re a genealogist if you’ve ever had your photo taken in front of a tombstone and you were actually smiling! You know you’re a genealogist if you know more about the past than the present. You know you’re a genealogist if you know what a GEDCOM and an ahnentafel are. You know you’re a genealogist if you have no problem substituting your great great grandmother’s maiden name for your mother’s (in answer to a security question). 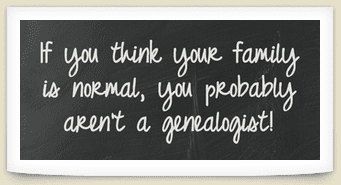 If you think your family is normal, you probably aren’t a genealogist! You know you’re hopelessly hooked on genealogy if you say “Honey, I’ll just be a few minutes on the computer,” and then find yourself awestruck by the sunrise. 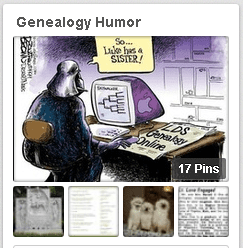 If you’d like to laugh a little and enjoy more genealogy sayings and quotes, be sure to visit these Pinterest boards. GenealogyBank Update: 13 Million Newspaper Articles Just Added! You know you’re a genealogist when you watch a movie that has a scene in a graveyard, and you’re distracted from the plot by trying to transcribe the tombstones. I laughed outloud on this one! Headstone epitaph: “This is the damndest thing I’ve ever done”. George. That is very funny. Thanks for sharing. Looking forward to receiving these humour quotes. Glad you enjoyed them Lucy! Add to Salt Lake, DC and Philadelphia bucket list are the graveyards inhabited by my relatives no matter where they are located. May I share with my genealogy group via our newsletter, with credit? Thank you for considering. Yes you may, Christine, with credit. We want to support genealogy groups! Thank you for asking. Glad you enjoyed my blog.